The belief that dogs are colorblind, in the sense that they see the world only in black and white and shades of gray, is a common misconception. Dogs do have color vision. 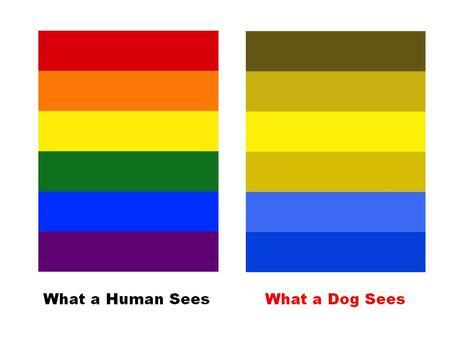 However the range of colors that dogs see is much more limited than the range of colors that we humans see. Dogs can still see colors, but their visual world is reduced to yellows, blues, and shades of gray. Did not know that. Kool! This is great when mum is walking an agility course and thinking my point of view with things like weave entries. Yes and it’s something to keep in mind when choosing toys. The orange toys might be harder to see in the grass! Thanks, Ruby. We are always striving to understand your point of view! I think this is the same for horses too.